The minute I saw that line in the governor's budget proposal — $1.5 billion in revenue from Indian gaming — I smelled trouble. The math looked pretty shaky to me, and if that part of the Gray Davis balancing act was wobbly, what were we to believe about the rest of it? By way of background, the governor and Legislature are not in charge of state government. Sacramento is owned by Indian gambling interests, and, to roughly the same extent, by prison guards. These lobbies go shopping with millions of dollars and never leave the Capitol empty-handed, which is the kind of deal making that helped get us into this mess. 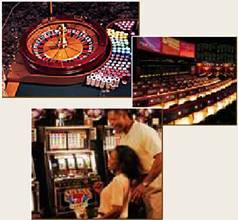 Between 50 and 60 tribes run an essentially untaxed gambling industry in California and rake in $5 billion a year, thanks in part to Gov. Dances With Donors. In his first term, Davis pocketed more than $1.3 million from the tribes, and didn't much get in their way. "For too long, California's Indians have been denied the respect and dignity they deserve," Davis said in 1999, the year he signed gambling compacts with tribes. "That sad chapter in our history ends today." The compacts are essentially a reparations program, and we all know Native Americans got a horrible deal in this country. But I'm not sure how much dignity there is in 50,000 slot machines. I'd be happier about it if the wealth were being spread around more equitably within the tribes. Gaming chiefs are so flush, they've thrown a staggering $120 million at political campaigns and ballot measures since 1998. But many of California's Native Americans remain locked in wretched poverty. So, clearly, we've got a bad thing going, and voters share responsibility, having approved two statewide gambling propositions. But what does Davis do? He takes a look at a budget hole pegged at $26 billion to $34 billion, depending on whom you believe. And then he looks over at New York and Connecticut and other states that were smart enough to get a cut of 15% to 25% of the action on Indian gaming. Here, the Davis administration gave away the store. So now he wants to rewrite California's deal with the Indians. If they'll give him a cut, he'll let them expand their gambling operations. And based on this rough idea, he figured he could make $1.5 billion in the next fiscal year and a half. First of all, I don't think there's any way he can make that kind of money that fast. Not every tribe wants to tinker with the dream deal it's already got. And even if some tribes do go for it, can they expand in time to plug the current budget gap? We lose either way. Either Davis can't get the $1.5 billion, and sticks the Legislature with the job of finding it somewhere else. Or he can, which will mean a huge, rapid expansion of a corrosive force. Why stop at slots? Why not let the Indians open drive-through drug marts and get a piece of that? "He must have picked the $1.5 billion out of thin air," said a state official who asked me not to use his name. "Right now, my best guess is that only about four tribes, and maybe up to six, would immediately request an expansion." I talked to an attorney who represents several tribes, and even he had his doubts. "Certainly there would be tribes interested in additional slot machines," said Howard Dickstein, who suggested they might only be willing to share revenues from new slots, not existing ones. "Whether there would be enough to raise $1.5 billion remains to be seen, but it sounds optimistic to those of us familiar with the market." When I called the governor's office last week, I was told he hadn't even had formal discussions with the tribes. And Thursday in Sacramento, Davis himself seemed to hedge, admitting he was playing a wild hunch on that $1.5 billion. "If I can be assured that there's a need to do it, I'm open to it," Davis said. "But first ... there has to be an indication that there's a demand...."
Well, if he hasn't had one, why did he pencil in $1.5 billion? "I'm sure the state will get something," the official told me, "but Lord knows what it'll be. And at the other end is the question of what it costs the state when you allow wide open gambling, unlimited slots and the guarantee of a monopoly forever." "I do not personally favor gambling, and certainly do not encourage others to gamble. Therefore, I am not generally inclined to support measures that allow more than a modest expansion of gaming." He said this after vetoing a mule racing bill. But then he reversed himself. The mules must have a political action committee. Indian gaming is "essentially untaxed" because Indian tribes are sovereign nations. One sovereign government can't tax another. Indian gaming is making money not because of Gov. Gray Davis but because California's voters overwhelmingly passed Propositions 5 and 1A. The law required Davis to negotiate a fair gaming compact. Finally, Indian gaming was never meant to "spread the wealth around"—to help all tribes equally. Just as the state lottery helps California but not Arizona, gaming helps the tribes that choose to pursue it. Lopez's column is even more insensitive than his column last year on the "Redskins" license plate. Next time he should consult a few Indians before shooting off his mouth. As Michael Lombardi said at January's Western Indian Gaming Conference, tribal governments would be remiss if they didn't lobby for their constituents. But they don't dominate the state government as TIME magazine alleged in its hatchet job on Indian casinos. "If we controlled the legislature," Lombardi asked, "why don't we have sacred site legislation?" Basically Lopez has repeated TIME's mistakes. To learn why Lopez is wrong, see the Responses to TIME's Attack on Indian Gaming. For another writer who is equally wrong about Indian gaming being a "reparations program," see Dickey: Indian "Gambling Monopolies" are "Reparations."